DIE Jovis, 20 die Decembris. Ly. Frazer & al. Nat. Bill. Message from H. C. with a Bill;--for a Conference on the Coinage Bill; and to remind the Lords of the one about Irish Cattle. Heads for a Conference in the Bill concerning Irish Cattle. Petition to the King for a Commission for examining Accompts. Epus. Rochester. Comes Clarendon, Ds. Cancellarius Angliæ. Johannes Ds. Robertes, Custos Privati Sigilli. Comes Lyndsey, Ds. Magnus Camerarius Angl. Hodie 1a vice lecta est Billa, "An Act for naturalizing Dame Mary Frazer and others." A Message was brought from the House of Commons, by Sir George Downing and others; who brought up a Bill, intituled, "An Act for erecting a Judicature for Determination of Differences touching Houses burned or demolished by reason of the late Fire which happened in London;" to which their Lordships Concurrence is desired. 2. To desire a Conference concerning the Bill for Encouragement of Coinage. 3. To put their Lordships in Mind of the Bill concerning prohibiting of Irish Cattle. That concerning the Conference now desired, the Lords will send an Answer by Messengers of their own; and their Lordships are dispatching Business as fast as they can. ORDERED, That the Committee that are appointed to draw up Reasons for a Conference concerning the Bill for prohibiting Irish Cattle do meet To-morrow Morning, at Nine of the Clock: And the Earl of Aylesbury, Vicecomes Fauconberg, and the Lord Gerard of Brandon, are added to that Committee. "To the King's most Excellent Majesty. "We do most humbly desire and advise Your Majesty, that You will please, upon so extraordinary an Occasion, to grant a Commission under Your Great Seal of England to such Persons of Credit and Reputation as to Your Majesty shall seem fit, to examine and state the said Accompts, to the End that the same may be presented to Your Two Houses of Parliament, who cannot but be much satisfied to find all the said Accompts to be just as they ought to be." 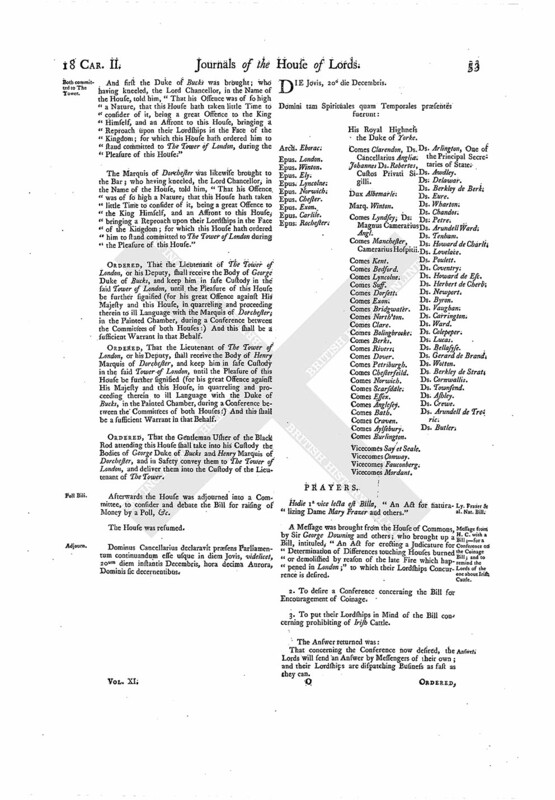 The House approved of this Petition; and appointed the Lord Chamberlain and the Lord Arlington to present the same to His Majesty from this House. 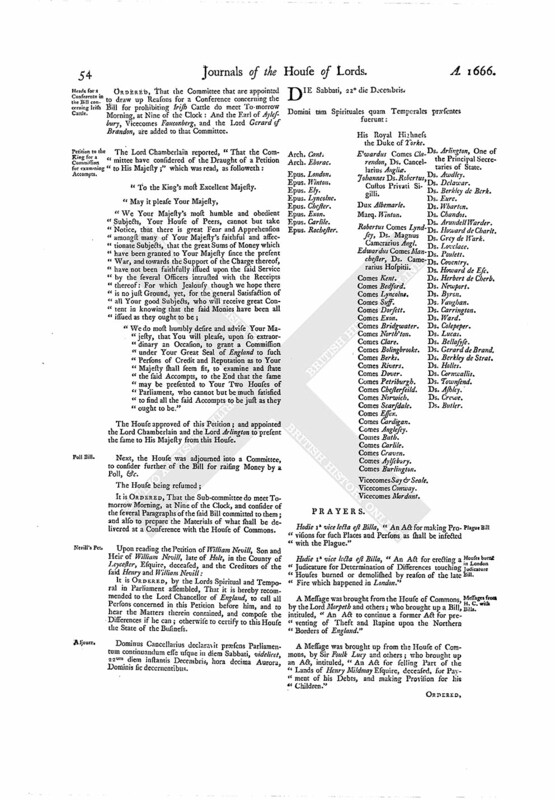 Next, the House was adjourned into a Committee, to consider further of the Bill for raising Money by a Poll, &c.
It is ORDERED, That the Sub-committee do meet Tomorrow Morning, at Nine of the Clock, and consider of the several Paragraphs of the said Bill committed to them; and also to prepare the Materials of what shall be delivered at a Conference with the House of Commons. It is ORDERED, by the Lords Spiritual and Temporal in Parliament assembled, That it is hereby recommended to the Lord Chancellor of England, to call all Persons concerned in this Petition before him, and to hear the Matters therein contained, and compose the Differences if he can; otherwise to certify to this House the State of the Business. Dominus Cancellarius declaravit præsens Parliamentum continuandum esse usque in diem Sabbati, videlicet, 22um diem instantis Decembris, hora decima Aurora, Dominis sic decernentibus.